October 26, 1942, The Battle of Santa Cruz. The Japanese have deployed major land and naval forces under the command of Vice Adm. Nobutake Kondo to retake Henderson Field on Guadalcanal. Included are four carriers. The Shokaku, Zuikaku, Zuiho and Kumano, able to launch194 aircraft. Opposing is Task Force 61 under the command of Rear Adm. Thomas Kinkaid, with two carriers, Hornet and Enterprise, able to launch 137 aircraft. From the time of Pearl Harbor the Americans hesitated to gather their carriers into large formations due to the superior numbers the Japanese possessed in planes and ships, especially carriers. The Americans were not ready to start sparing head to head with the odds this much against them. The Americans just did not have the carriers to lose. In Fact the carrier Enterprise was undergoing repairs and had to be rushed back into service. It do not leave Pearl Harbor with its Task Force until October 15th or it could have been 4 to 1 in carrier availability. The entire morning was building into bloody brawl between the opposing air groups. The American Dauntless’s and Avengers find the enemy carriers first. But now the Japanese find the American carriers. Hit first by Val dive bombers, and a few crashing Japanese aircraft, the arriving Kate’s find a very weakened Hornet and perform a textbook torpedo attack coming in from starboard bow and the port quarter. The Hornet is now boxed in as torpedos start slamming into it’s sides. Flying CAP from the carrier Enterprise this day is Donald "Flash" Gordon. Don had entered the Naval Aviation Cadet Program July 7th 1941 and was just commissioned an Ensign March 12th 1942. Now at around 0940, Donald finds himself Flying the F4F Wildcat right in the middle of a torpedo attack on the USS Hornet. He helps disrupt the attack by flaming two Kate's and damages a third. Donald ends the war with 7 confirmed victories. However the reluctance to keep the carriers together has doomed the Hornet. Now abandoned with raging fires, the task of sinking the burning hulk falls to Japanese destroyers. 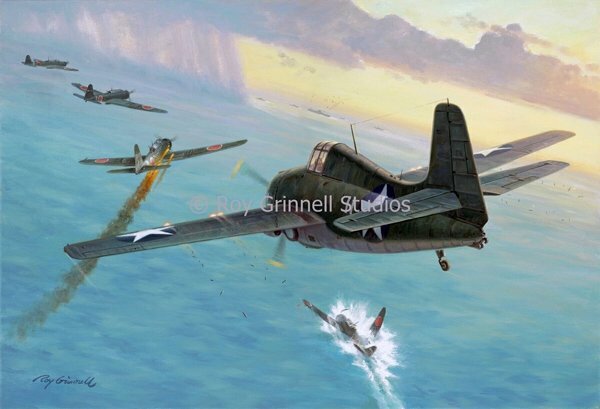 During this battle, the country would also lose Dauntlass dive bomber pilot turned fighter pilot Lieutenant John Leppla and his back seat gunner John Liska who together are created with 7 victories. Leppla is credited with four victories flying the Dauntlass and his 5th victory was achieved while flying a F4F Wildcat with VF-10. He was awarded the Navy Cross twice. Aircraft losses for both sides were about equal. For the American’s the day ended as strategic victory, Guadalcanal and Henderson Field remained under our control. For the Japanese, most of the dive bomber crews were lost and about half of the experienced pilots that took part in the Pearl Harbor attack were lost. Leadership at various levels were hit hard. Though damage to the Zuikaku and the Junyo was not serious both were taken out of the war for months.